Very interesting post steve,thanks for it. 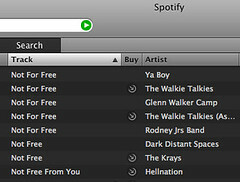 But I wonder – you say you don’t recommend paying for spotify at all. But i’m someone who hasn’t paid for music at all in 5+ years that recently signed up for there service and am happy to pay. Should i stop and go back to my old ways? Would that help artists and music? Would like to hear your advice on this. I think regardless of whether you pay for things or not, I think you should make friends with – or at very least get to know more about the lives of – the people who make the music you love. In your relationship with them, an answer to all this will become clear. One other thing: I am unsure what is meant by Spotify’s ad-supported and subscription-supported royalty rates being “distributed evenly”. I suspect it doesn’t mean that they are using exactly the same cost model. I can only speak for we7, but our contracts require us to keep the subscription revenue ring-fenced. It is shared out on a pro-rated (by number of streams) basis to the labels: i.e. if label X’s recordings account for 21% of subscribers’ streams, then label X receives 21% of (an agreed share of) the revenue. When we work that out as a per-stream value it *is* more than the ad-supported rate, but not by much – certainly nothing like the difference between free and a tenner a month! As for Subscriber vs ads, are you suggesting that when divided up, the ad revenue for *one* play (ie, the money earned from that listener listening to that ad) is the same as the fraction of a tenner (minus hosting/streaming/admin/% profit to We7)? Or do you mean that the total of all ad revenue equals the total of all subscriber revenue? Because in order to get that Ad revenue, I’m assuming you need WAY more ‘ad supported listeners’ than the number of premium account holders you need to make up that figure… or is each ‘free’ listener REALLY worth a tenner a month to you??? number of ad-supported listens ÷ total ad revenue = ??? number of premium account listens ÷ total premium revenue = ??? I need to think about it some more. Thanks again for your comment, I really appreciate your thoughts and information! When it comes to your two equations the latter does result in the bigger number, but not by as much as you might assume. And I’ll add a caveat to all of this: we’re in the very early stages with subscription at we7, and so these early indications may not be representative. You’re certainly not the only one to be uneasy about it, and I don’t even begin to know the answers. But here’s the way I see it – these new services are an experiment to see what can be made to work. Naturally, not every turn will be a good one. Hmm… there’s lots more to for me to think about. …indeed I do, though given the multicurrency way things work online (cash is only one way of expressing value, and perhaps not the most useful or important one in many situations) I see the willingness to sit through an ad as being a payment. What about if Spotify (or other ad-funded music services) started getting the targetted adverts thing more together? For example, perhaps adverts could have a “like” and “dislike” button. That way you could mute ones you particularly dislike (a win for you), the advertiser at least gets some feedback (a win for them) and Spotify get data which will enable them to make better guesses about what fits where and and also a tool to measure that (a win for them and probably a PhD thesis for someone in information science, too!). Another possibility would be if you could create an ad-list alongside your playlist and pick the adverts you most want to listen to. Not everyone would use it but, again, it could be a three way win. That’s a really valid point. That being said, when offered the opportunity to express oneself on whether or not they like an ad, most people would say they dislike them, even if they are fairly targeted. So I’m not sure that would really work. When you put an ad on the radio, it’s a similar story. The radio had data on the demographic of their listeners. But Spotify is not a website, and it’s not a radio station. It’s an on demand music service, where its users choose what they want to listen to. It’s not a passive experience. You choose an album you want to listen to as opposed to just listening to what the radio station has to offer. So how do you target ads? Can you determine a person’s demographic just by analysing their taste in music? Spotify only knows my postcode, the country I live in, my age and whether I’m male of female. So they can try and sell me men’s underpants if they want! Another problem faced by Spotify is the production and implementation of ads. If you advertise on the internet, you can go through Google AdSense, or similar advertising services, based on keywords, etc… Everything is text based. And the normal website ads generally include text, images and in some cases sound. You can choose what kind of website your ads appear on. I don’t know about you, but I don’t look at the Spotify application very often so the only way of grabbing my attention is by playing an audio ad. So it seems to me, Spotify is missing out on a large amount of potential ads because their medium doesn’t fit very well with the current advertising models. So you’ll hear crappy homemade ads or see a large takeover in the application. Based on the quality of some of the ads, it’s pretty clear the advertisers didn’t spend much money on production, so it seems pretty obvious that they didn’t spend much money on their advertising campaign either. If they want to start making some money without annoying people, they should do something like Last.fm powerplay or Jango Airplay. You choose a bunch of artists that are similar to your bands, and you pay to have your music played to people who listen to those artists. It solves the recommendation issues in Spotify (to a certain extent) and will make Spotify some money in the process. Another idea I had for Spotify is for them to build a custom platform for ads that changes the background music of the ad based on your taste in music. A lot of the ads don’t even have background music and sound terrible. If you do a mash up of both ideas, what you get is a less disruptive ad because you move seamlessly from the music you like to music you probably like with an ad sitting on top of it and an opportunity for unknown bands to provide their music for an ad in exchange for a some exposure. In this case, the band would just provide the music for free of course. Spotify wouldn’t even have to worry about how to choose the music because the bands providing their music would select artists they think they sound like and the targeting could be done based on that. It doesn’t solve the problem of whether or not the contents of the ad is well targeted or not, but it would certainly improve the user experience and increase their advertising revenues. If spotify is aiming at paying similar rate to artists as radio does per listener then presuming advertisers will pay similar rate per listener as radio ( and well targeted adds should be a premium product) there is no reason why this model shouldn’t be made to work. If its currently loss making thats spotify’s prob not mine, and if artists are getting similar rate to radio then i don’t see it as their prob either. Far as premium goes – i can see how an add free product could develop into an alternative to cd buying so can see artist case for higher rates – on the other hand the maths rather depends on how many times you’d expect fans to listen to an album if they bought it. ( And how much you’d have expected as an artist from each sale) I can also see a strong case that a play is a play is and my choice to listen to adds or or pay to remove them is and irrelevant to how much the band should be paid. Sounds like the royalty rates need very close examining, which spotify seem to be doing their best to avoid. At the mo this isn’t really a prob spotify is small and if its replacing cd purchases for only a handfull of folks, but if we moved to a future where streaming were the norm rather than ownership then the precise details become a vitally important issue. We need transparency from spotify pretty soon. Oh in calculating how much artists should get per spotify plays i’d best point out half my plays i have on cd just can’t be arsed having a rumage in my boxes of cd s.
No. I can’t explain it in detail. All I can say is that premium plays do count. Count in what way? That doesn’t help. If you don’t know, say so. If you do know, let us know how. My initial statement was based on a quote from Daniel at SXSW. If it was wrong, as I’ve said, that changes everything. So far you’re not giving me anything to go on. Is it the same if you watch TV? I have only used Spotify free for short periods of time and in those times there were many very useful ads. I don’t own or watch TV. When I do watch TV programs via the web, it’s on the BBC iPlayer, so no ads. I don’t know. My guess is that they have a lot of work to do in the UK and Spain, but doing great in the other launch countries. How many listeners do you have in Spotify and why would you even consider hurting them? Do you really want to anger your fans by actually pulling your music off Spotify? As of today I haven’t seen any stats indicating that Spotify is taking anything away from artists. There is no cannibalization and yet you and many other artists act as if it is a fact. I find it both strange and frightening to see small artists think exactly like the very big ones in this matter. If you aren’t losing money, but rather making money, what is so bad about being there? If you have stats to show that you actually lose money because of Spotify it would be great to see them! Now who doesn’t understand. You’ve been linking to my post about the economics of Spotify for artists for ages – I don’t think Spotify is remotely ‘bad’ for artists. I think, as I say in this post, that Spotify has failed to differentiate between Spotify lite and Spotify premium in a way that makes sense to me. They’ve broken a link that I see as vital between payment and expression of value in and gratitude for music. At the moment they don’t have anywhere near enough premium users for it to be a big issue. Largely because £120 a year is WAY more than 95% of music listeners have ever spent on music. That’s a lot of money going into the music economy. The big question is how it comes out. There are loads of big questions over who’s getting it – every single bit of info I’ve seen about Spotify rates/payments/etc. has been speculative because they won’t/haven’t published any figures. Given that they are making money from playing adverts to people who are there listening to my music, it would make sense for them to tell me how much I’m getting, and how it compares to the rest of the artist there. That would seem to me like a fair, honest and open thing to do. Spotify cancelled my Premium account for me! Will blog but also has something to add re: their advertising models and privacy and an email conversation I’ve had with their legal council.